Look who is hiding behind?? Ah-ha! 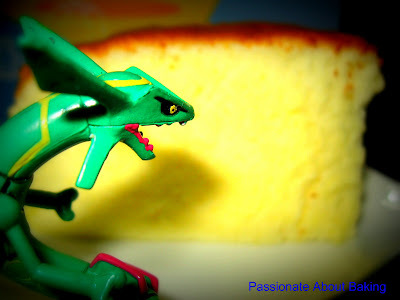 It's Rayquaza! He came to see if my Japanese Cotton Cheesecake is good enough to be considered "Japanese"! Post Mortem: For the benefits of those who are interested to know what is water-bake, here is a picture for sharing. I hope this is clearer now. As promised, here is the recipe from Alex Goh's "Fantastic Cheesecake". 1. Grease and line the bottom of two 20-cm oval pans. Wrap outside of the pans in foil. 2. Place (A) in mixing bowl and stir over double-boiler until thick. Remove it from double-boiler. 3. Add (B) and mix until well combined. Add (C) and mix until well blended. 4. Whip the egg whites in (D) until foamy. Then add the remaining (D). Continue whipping until soft peaks. Add it into the cheese mixture from step (3). 5. Pour the cheese filling onto the prepared oval pans. Bake in water bath at 160C for 40-45 minutes or until well incorporated. 6. Remove cake from the oven. Remove the cake from the mould immediately. Set aside to cool. My notes: I used a 8" round pan. I should have used a 9" round pan instead. Then it will be flatter and bigger, rather than higher and smaller. Wooooohhhh! Jane, this is beautifully baked. The cheesecake rise up so nicely. I believe it's very soft and tasty too! Any tricks on how to prevent cracking? I baked this kind of cotton cheesecake before but I've difficulty un-mold the cake. Can you please tell me how did you un-mold it so nicely? you use the water bath ? Actually I don't really how to do it yet, Can teach / brief me ? I think usually cheesecakes are water bake. You need to place a tray of water below your cake pan and then put it in the oven to bake. Temperature usually about 160C and not more. I use the 3rd layer from the top, and fan oven at 160C. You can try. As for unmoulding the cake, upon taking out the cake from the oven, the cake somehow started to leave the sides a little. So I just use my knife to separate it further and take it out. This recipe from Alex Goh is quite good. I will post up the recipe soon so that you can try it. Ya, I've not seen your post for a long long time. :( No recipe good enough currently for you to bake now? Yes, I water baked it. Yes, water bake for my cheesecake. Like I explain to Grace, with your filled cake pan, wrapped it up in the aluminium foil, then place it in a pan filled with water and put the whole tray into the oven. I shall post up a picture to show you. I hope this helps. Thank you so much for posting the recipe. I shall try again and hopefully the cake turn out nicely. Cheers! Wad do u mean by stir over double-boiler? "Stir over double-boiler" means you have a saucepan with water on the stove. Then you place your ingredients A on another stainless bowl and place it on the saucepan, with the bottom touching the water on the saucepan. It is not direct heat. You heat the ingredients A based on the heated water in the saucepan. It's like double boiling. I hope it's clear to you now. The cotton cheesecake really look very soft. I would to have a try to bake this cake too but not sure the flour that mentioned on this recipe is the all-purpose flour or cake flour? Do you set aside the mixture to cool after removed it from double boiler (step2) before continue step3? You can use the all-purpose flour (plain flour). With the addition of the cornflour, it will make the cake soft, so cake flour is not necessary. Once you remove the mixture in step 2 from the double boiler, you don't have to wait for it to completely cool down. In the double boiler, it doesn't really boil, so you can immediately proceed to step 3. I hope this helps. This is the first time I visit your site and I fall in love with it. Great blog you have!!! I own this Alex Goh's book as well and I tried to bake this cake, it failed. Ur version is definitely gorgeous. May I know what milk u used? I will try to bake this cake again. Never give up. I used the normal UHT milk. Like those Magnolia or Marigold UHT 1 litre milk you buy from supermarket? It's not from the fridge, but once you opened it, you'll have to keep them in the fridge. Lately, I found another creamier milk (as told by my son) from PH, and Fairprice is selling it also. It's called Meadow Fields or something like that. It cost only $1.55 in PH where Fairprice is selling it at $2.20. Don't buy low fat or skim milks, it's never good for baking this cake. Use the full cream milk, it's much lovelier! Could I use square pan instead of roudnd pan? What will happen if I bake the cotton cheesecake by the normaly way (not water bake)? Yes, you can use a square pan, but the size has to be smaller than an 8" round pan as square pan is bigger than a round pan if you use the same inch. So if using square pan, max size will be 6½"x6½" pan. If you don't water bake, then the cake might crack in the centre. But actually, even if you water bake, sometimes it also cracked in the centre due to the temperature of the oven. Hope this helps. Thanks for the info. I baked the cake yesterday by water bake at 150C for 55min and I felt the inner part of the cake still moist when I used cake tested to test it. May i why? The milk sold in PH is a good steal, thanks for your recommendation. I usually use UHT full cream milk for my baking (longer shelf life coz I don't drink milk :P) but I remember I used evaporated milk for this cake as I tot I wanted to give it a richer and creamer taste. I suspect the temperature as too low for cheesecake. Cheesecakes are usually baked at about 160 for 50-60mins usually. I think it wasn't cooked enuf, even though it was baked for 55mins. You might want to try again at 160C, and baked it for 45mins? A slight temperature sometimes does make a difference. Thanks again for the info. Will try tonight. I notice that this recipe don't use any baking powder. Will it rise ? Yes, it will rise. There is the beating of egg whites with cream of tartar. But of course, it will not rise too much as it's not meant to rise too much. It'll only rise a bit to make the cheesecake light. I tried baking this cake for the 2nd time, but still unsuccessful. The cake strink upon removed from the oven. It doesn't look like yours. Could you pls enlighten me. I used Ariston oven , baking mode which comes with fan, put batter on rack 3 and temp @ 160 for 45 mins. Do you think i shld use only the top & bottom heating elements ? if yes shld the temp & timing remains unchange ? looking fwd for your reply. Thks. Did you follow the instructions on the mixing method? Did you put in water bake like what was shown in the picture? If you are using a fan oven, then please reduce the temp by 20C. In this case, use 140C, and bake for 45mins. I suspect the temp was too hot, which was why it cracked on the top. Ariston oven is supposed to be very good. If you switch to top and bottom heat only, keep the 160C. Remember this, if you use the fan oven, always reduce the temp by 20C regardless of what you are baking. Otherwise, the temp may be way too hot for your bakes. Even when the top cracks, I supposed the cake also tasted very nice right? Try again using I said above. Let me know the outcome again. Feel free to email me if you need help: aloyallyanders@gmail.com. All the best! Thks 4 ur prompt reply. Yes I followed the instruction closely and i water baked it too. Yes the cake tasted very nice though it shrinked. Hubby n kids support and encouragement makes me wanna try again. I will use what u said in the next baking, won't give up. Sorry wish to ask u another qns, u were saying that temp to reduce by 20C irregardless of what I bakes, so I suppose it apply to sponge cake too ? I oso failed many times in baking sponge cake. It shrinked and some how certain part of the cake was moist, damn and compact. I used separate eggs beating method. Do you think a beginner, like me, should do the all-in method (beating egg yolk n white together) ? Thks 4 ur time. Rgds. Yes. Apply to any kind of bakes, be it pies, tarts or sponge cakes. Fan oven makes the temperature in the oven more uniform. Therefore, you need to reduce it by 20C. The parts of the cake that was moist was not heated enuf. Usually the centre part right? The sides are all baked, but the centre part not baked. Also, it might also be that the cakes were not well folded, or the egg whites have burst, causing the cake to be dense. Separating eggs is rather difficult as you have to ensure that you beat the egg whites well till stiff peak, and fold in the whites into the batter well without breaking the whites. The all-in-method might not be as ez as you think. I've tried it last time and failed many times because folding in the flour into the beaten eggs needs skills. Another way is to add emulsifier, as it stablised the bubbles better and makes the cake softer. But emulsifier is afterall, a chemical. Wow!! thks 4 ur detailed and valued explaination. Last but not least, do u beat eggs at high speed then at low speed, or vise versa ? and for how long at each speed ? Really feel paisei asking so many qns. Hope u dun mind. Yes, wish me luck in my next baking. No worries. I'm just sharing what I have learnt and experience. I've been through failures many times, and I really can empathise. If you refer to egg whites, I will start low, only after adding sugar then I will go med-high. For whole eggs, I usually go to high, then slowly down to medium after it has increased in size. For emulsified eggs, I'll do the same for whole eggs. I can't really tell you how long, for this, it's really personal experience. Sometimes can be 10mins, sometimes lesser or more time required. It depends on what kind of mixer you are using. I'm using a Kenwood chef. So it's considered pretty fast and good. Don't feel paiseh to ask questions. We are all learning. I also get to understand my oven through "Kitchen Corner". Just couldn't wait to share with u. It doesn't crack or shrink this time round , the only imperfect was it did not rise as high as yours. Could it due to the size of the cake tin i used ? I used a 9" cake tin. Anyway it doesn't matter. Really wants to thank you for your patience,guidance and the luck you have prayed for me ...haha. U r my shifu !! and I think i will have more confidence in other baking. 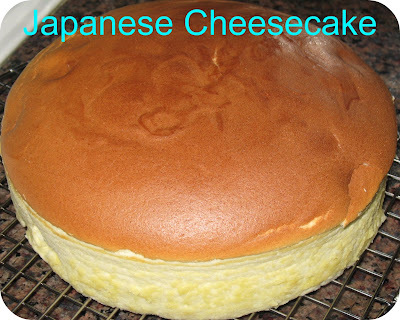 I have been looking for a recipe for a Japanese Cheesecake forever... I even tried baking one earlier this year, but the recipe called for lemon juice (the only Japanese cheesecake I've eaten was mildly sweet, and did not have a lemon flavor)... Anyway, I decided to give it a try, 'coz I thought the lemon would help with the egg smell... The cake while it was soft and spongy, tasted so lemon-y, it was awful... Anyway, your recipe sounds perfect for me... The only question I have is, does it smell too egg-y??? I was thinking of adding vanilla essence, but wanted to pick your brain as whether you've tried adding vanilla as a variation to your cheesecake... And, if so, how much did you add to your recipe??? May I know what is brand of oven do u use for yr baking? All your cake looks so awesome and perfect. I would like to get one oven as my current portable oven is giving me headaches...Hope you can share.. Currently, I'm using Delonghi for my bakes. It happens to be the biggest kitchen top oven I can find. You can find it in most electrical stores including Tangs. I got mine from Tangs. You can check them out. Hope this helps. Thanks for your compliments. Hope you can find an oven that is suitable for you. Thanks for replying. I tried baking this cheesecake today and I tried whisking the egg white and unfortunately it doesnt form soft peak. The mixture is watery even i added cream of tartar and sugar. Could you kindly enlighten what went wrong...However, I still continue to fold cheese mixture to watery egg white mixture. Hope you can share some tips of egg white whisking.. I suspect you didn't whip up the egg whites enough. If you had whipped up enough, then it shouldn't be watery at all. You should whip up the egg whites till frothy, until you don't see the liquid at all. Alternatively, you can add in the cream of tartar into the egg whites to whip. Make sure it's frothy and the bubbles in the egg whites are very very fine before you add in the sugar gradually. Remember, when whipping egg whites, make sure your mixer and bowl is clean and free from oil. Start with a consistent medium speed. I hope this helps. Hope you can try again. Thanks for your advise. I am not good in separating the egg white and egg yolk. I recalled and probably the egg white mixture consisted of slight egg yolk. Does this affect when whipping the egg white? I'm glad you found the root cause! Yes, egg yolk is an enemy of egg whites. Always remember, when you want to whip egg whites, never to have a drop of egg yolks as it will affect the whipping of the whites. How I separate my yolk and white is, crack the egg into a bowl, then scoop up the yolk with my hand to separate it. If the yolk happen to break, I'll pour it into another container, wash my bowl clean again, and crack another egg. Try again and see how. I'm sure it was due to the yolk! Good luck! In Alex's recipe, he used two small oval pans, whereas I use one round pan. Therefore, it's dependant on whether you prefer two smaller loaves or one bigger loaf. I suspect your cake didn't rise has nothing to do with your flour. It's mainly due to the way you beat your egg whites and how you fold the meringue into the cheese mixture. 1/8tsp cream of tartar can be measured using 1/4tsp and halved it. You need to buy a set of measuring spoons if you already don't have one. I hope this helps. Drop me an email at aloyallyanders@gmail.com if you have more queries. Thank you. AHHH!! this cheesecake tasted so good!! thanks for the posting the recipe. it didn't turn out as cottony but i'll try it again another time. the batter only made one 8 in pan for me, not two. where do you find a alex goh book? he has such great recipes. Glad you like the cake. This recipe is enough for a 8" round cake pan, not two though. You can purchase Alex Goh's books from local bookstores, if you live in Singapore. Malaysia also sells his book as he is a Malaysian. hi, i baked this cake today but not so successful. read thru your answers to others. i think most likely my oven temp is too high (top cracked). the cake rise beautifully in oven, but srink and sink after take out from oven. will high temp cause shrink? thanks for advise. byw, I didn't use cream of tartar. the egg white whipped to soft peak. did it matter? Yes, it was due to the oven temperature. Bubbles in the cakes are very sensitive. When the cake rise too early and too fast, the chances is, it will collapse. Try reducing the temperature of your oven, or place your cake in the lowest rack in the oven. The usage of cream of tartar is to stabilise the egg whites. If you can whipped it well, and you are fast enough in all those folding and baking, then it's okay to omit the cream of tartar. Otherwise, the egg whites might get inflated during the folding stage. thank you vm for your advice. i will try again in this week. I can always whip the egg white well without cream of tartar. I notice the cake bubble is flat but not round. is it means the bubble deflated during baking process? will cream of tartar help during baking process or just during whipping process? If you can whip the egg white well without cream of tartar, then omit it. From my understanding, it helps the stabilising of the egg whites during folding and baking process too. Without cream of tartar to stabilise the bubbles, your action from folding to pouring the batter into the pan and putting in the oven needs to be very fast as bubbles deflate very fast. I hope this answers your query. Thanks. this cake is too light for me but I also don't like NY cheese cake, which is too thick. haha, i am in between. i also baked japanese cake use cheese up to 8oz, but still haven't find my best recipe. i like the type of Don Pie at china square. 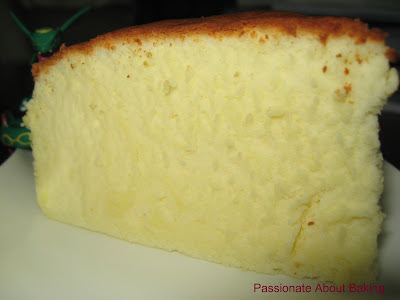 do you know any recipe which is sweet type cheese cake but stronger than Jap cheese cake? Thank you!!! i need your help, as i am learning how to bake...I followed your recipe very closely, but fail.. I used full cream milk instead of UHT. does this mater? I am not sure whether over whip (using handle mixer) will bother the baking? There is still bubble tho but i dont know how it should look like..
And i used double boiled method, and baked for 45 mins but the cake wont raise and still wet inside (using a stick to poke) can you advise? I will appreciate you can email me at diser16@yahoo.com.sg for your advise. hi,is it a must to wrap the baking pan with the aluminium foil? why my cake drop after cooling down and it is wet inside? It's not necessary to wrap the pan with foil. Wrapping it with foil is to delay the heat to the batter. The reason why your cake dropped and is still wet is because your oven is too hot and it was not fully cooked when you removed it. You need to understand how your oven works and what is the actual temperature of the oven when baking. oh okay, thanks so much! is it i need to change to top and bottom heat? cause im using top heat and fan. Yes, you need to use the top and bottom heat, with fan. Reduce the temperature by 20C whenever you use fan as the heat is more uniform. Hope this helps. I tried your recipe twice with no success. Both times the cake went flat when taken out of the oven to cool. I think I need more practice with folding the batter into the egg white mixture and know when to stop beating when the egg white is in soft peak stage. Can you describe the appearance of the soft peak stage ? Thank you. I can understand. Beating egg whites and folding them is no easy feat. It needs practice. When the cake went flat, there's probably two main reasons - either the egg whites were not beaten properly or the oven is too hot. Soft peak stage is when you hold up your beaten egg whites, the egg whites fold back and form sort of like a bird's peak. I hope this helps. Good luck in your baking! thank you so much for the advice. I have tried this recipe many and many times. It looks beautiful with the even brown top but it's only fluffy half top. I do not understand why my cake always has dense bottom even though I go through many tips from the internet. Do you think too much water in the water bath causes the problem? Can I over beat the whites to make it firmly stiff instead of soft peaks? Thanks. I'm happy to know that you like it. Yes, I suspect the dense bottom could be due to water sipping through to the base, which made it moist and dense. Another reason could be due your folding. You did not fold the egg white batter thoroughly, resulting in the heavier cheese batter to sink to the bottom. It's better to beat the egg whites to soft peak so that it's more stable and easier to fold. When the egg whites are beaten to stiff peak, it's more difficult to incorporate, and become more unstable when you try to fold them, and might cause the bubbles to break instead. Hope this helps, and I hope you'll be successful the next time. Good luck! Hi there! I tried this recipe today. First time baking cotton cheesecake actually. The texture is soft but the cake itself shrink after it cools down and the top become wrinkled. No crack though. Any advise on how to avoid the shrinkage and wrinkles? :( Apart from that, the cake is really soft. Glad that you like the recipe. I believe when the cake shrink after cooling means the oven is too hot. When the oven is too hot, the cake rises very fast. Therefore, when cooled, it will shrink. Try reducing the temp of the oven by 20C to see if it works. Hope this helps. Hi, can i ask what flour are you using for the 40g flour, can i use low protein flour? I used plain flour. You can use any flour, except for bread flour. Hope this helps. Hi, you said to line a two 20 cm pans, have you prepared two cakes out of the mixture above? Or just one pan is enough? Original recipe used two 20cm OVAL pan, I used one 8" ROUND pan. Hope this clarifies. Hi Jane, your cake looks beautiful and I tried to bake it by following your recipe. However, I do not know why my cheesecake has two layers in it. The top part looks exactly the same as yours but the bottom part is custard look alike. Do you have any idea on what problem is this? I have followed all the step by step method in the recipe. (3) the batter took a long time before it went to the oven for baking. These could be the possibilities. You have to evaluate the steps which you have taken to cause this problem. As for non-stick pan, I don't think it will affect the baking. As long as you don't grease it, it will still rise further. Hope this helps. Give it a try again, I'm sure it'll be good this time. Good luck! I cannot remember exactly how long. If you had underbaked, it's likely your temperature was too low. Mine was set at 160C fan oven, means 180C normal bake function. Hope this helps. Hi, can I use 8 inch black colour non stick pan for this recipe? My advise is no non-stick pan. You need to use aluminium pan in order to allow the egg whites to expand and "climb" up. With non-stick, it will not be able to stick and expand upwards too much. Hope this clarifies. Thanks for your advise. But I only have 9 × 5 inch rectangular aluminum pan, can I use it? The pan may be too small for the batter. You can consider to halve the recipe or 3/4 of the recipe. Alternatively, you may pour the remaining batter into those tall muffin cups? And yes, you can use that 9x5 aluminium pan. Hi. Great blog here! :) would like to know if youve tried this recipe without thw eggyolks... i have extra eggwhites and would like to try this recipe. What do you think will be the outcome if i will omit the eggyolks? If your oven is a table top like mine, I placed on the 2nd last rack. Yes, you can bake at 140C fan forced. Thank you for your reply. If I bake at 140C fan forced, how long should I bake it for? You have to bake for at least 50-60mins at 140C. Don't overbake.